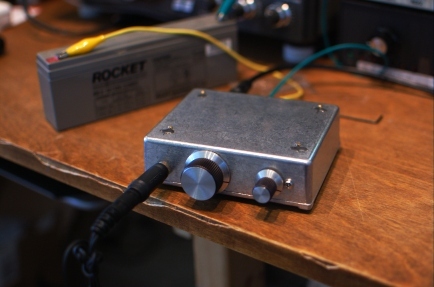 I recently read an excellent post by W2LJ on non-QRPers’ perceptions of “the frustration of QRP.” While I’m in 100% agreement with what he writes—essentially to “act loud” when you’re operating QRP—I’m guilty of the very first sin he calls out at the beginning: advising new hams not to start on HF with [a] QRP [rig]. I stand by this advice. Here’s why. 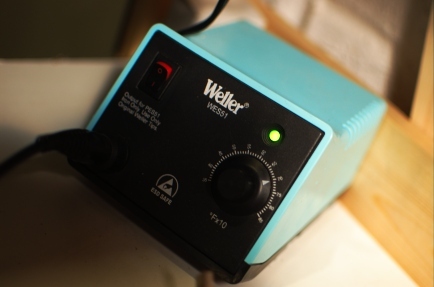 The advice is often solicited in the context of saving money by buying a QRP radio (e.g., FT-817, IC-703, KX3, etc) versus a full-power unit (e.g., FT-857, IC-706/IC-7000, KX3+KXPA3, respectively). 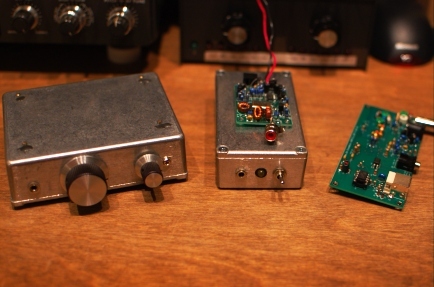 Everybody wants to save money, not everyone wants to operate QRP, whether they realize it or not. It’s a whole heck of a lot easier to crank a 100-watt radio down to 5 watts than it is to crank a 5-watt radio up to 100 watts. So why does that matter since we’re talking about why people should or shouldn’t start with QRP? If you operate QRP, look at your log. You should see a pattern. Most of your QSOs are on CW or digital and on the “core” HF bands, 40/30/20/17/15 meters. QRP is not frustrating at all, as long as you operate CW (or digital) into decent antennas on certain bands. Knowledge and skill indeed trump power. But, if you are just acquiring knowledge and skill for the first time, a little reserve power doesn’t hurt. Just my thoughts. I found myself in Santa Fe, NM, for Field Day this year to attend a conference. As I have shared before, I have mixed feelings about Field Day, but this was a genuinely good time. I first checked ARRL’s Field Day finder map and the local club’s web site for activity. Zilch. 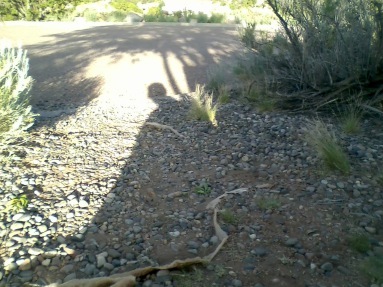 So, I remembered staying at the Fort Marcy Hotel Suites on several previous visits to Santa Fe. These condos are up on a hill overlooking town. 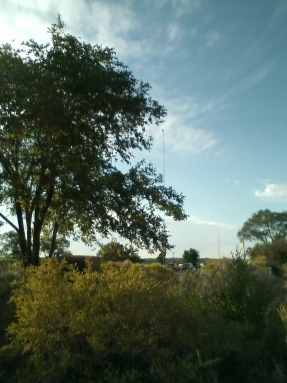 Across the street is Hillside Park, with a couple of scraggly trees that might be suitable for antennas. Instead of bringing the “usual” portable station, I brought a Small Wonder Labs SW-40, a K1EL K12 memory keyer (assembled especially for this trip), Palm Mini paddles, a 40-meter dipole, and a AA battery pack. The whole station took up less space in my luggage than my notebook computer and set up in 15 minutes. I got the dipole center about 4-5 meters off the ground and the ends sloped down to about 2-3 meters high…just enough to allow cars and small trucks to pass under them in the parking lot. Apologies for the photographs…they were taken with my cell phone (which is a regular old “dumb” phone). The SW-40 did not appear to be transmitting correctly when I first hooked everything up. So, I pulled the cover off (packing a Leatherman tool is another good reason to check a bag) and wiggled some wires around until it fired up. Not an auspicious sign. 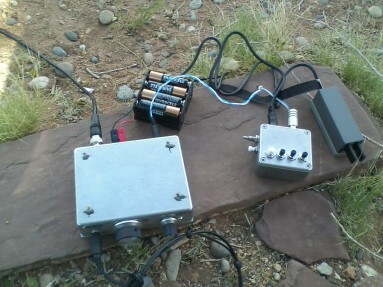 But, I did manage to operate for about an hour and make 12 or 15 QSOs. They’re logged in a notebook, but I haven’t looked at it since making the contacts. Virtually every QSO was a struggle. Low power (1.5 watts), wrong band (20 meters would have been better), a low antenna, and the fact that I hadn’t used the SW-40 for any QSOs in over 10 years, conspired to make thing difficult. Most operators pulled me right out once I was in the clear and zero beat (which I think was a serious challenge with the slightly drifty and definitely touchy SW-40). My final QSO was with my old radio club from my college days, W8FT. The operator was my good friend Bill, AD8P, who worked hard to pull me out once he got my call right. After I packed up, I noticed that I had a missed call on my phone…sure enough it was from Bill. So, I gave him a call and we talked for a couple of minutes. “When he answered the phone, he said, `New Mexico?!?! I told Kelsey (N8ET) that’s what I had copied. '” We had a nice chat as I hiked back down the hillside into town and he pulled into his driveway after his FD shift. I don’t think I’ve ever been so delighted with a Field Day effort of so few QSOs (except maybe my first Field Day, which was much more work for about twice the number of QSOs). Including the walk from my hotel to the park, setup, tear-down, and operating, I think the whole exercise took about 3 hours, and was tremendously FUN. This is about building electronics, not making beer, at home; although, I am sure there are parallels. Three things brought me to writing this: 1. an eHam forum thread I responded to a few weeks ago; 2. the June 2011 issue of IEEE Microwave magazine (has articles by K2UYH, N2UO, and KK7B, perhaps others? thanks to W3KL via the PVRC reflector for bringing it to my attention since I let my IEEE/MTT membership lapse); and 3. a few minutes spent last night resuming a partially-completed Softrock kit gifted to me by a friend who decided to buy a FLEX-3000 instead. 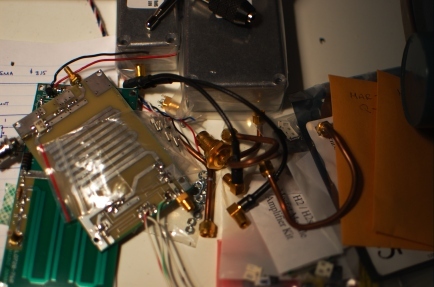 Every once in a while, a thread appears on an amateur radio forum that goes a little bit like this, “Hi, I’m a new ham and I don’t have a lot of money to spend so I want to build an HF SSB station from scratch” or something similar. Somehow, somewhere, somebody has given the impression that it is less expensive to build your own amateur radio equipment than to buy it. That’s true in some circumstances, but certainly rarely for anything that is mature, mass-produced, and readily-available on the second-hand market. After all, there is nothing novel about a 100-watt superheterodyne HF SSB transceiver these days. The principal uncounted cost is the “engineering cost” associated with getting your first few projects working and keeping them working. As I soldered down 1206-size (easy ones) SMT capacitors last night, I was thinking of times that I rushed through a homebrew or kit project just to get it on the air. In those instances the process was often, as I have belabored above, about saving money, not about the act of creating something. 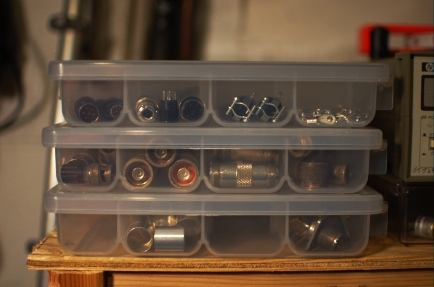 Last night was about creating, not saving, and that is the joy of homebrew. Time, as they say, has been of the essence of late. So, when I do have time to play radio, I rarely have a chance to write about it. Here are some photos of my latest tinkerings. 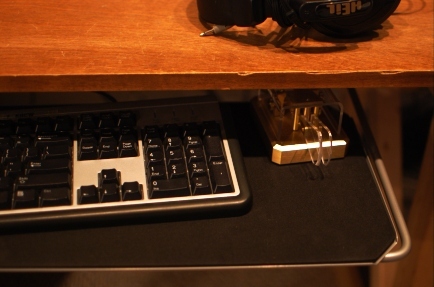 Sarah has always talked about using a keyboard tray at work as a part of an ergonomic workstation. Until recently, my work invovled enough variety of computer and non-computer time that I did not think about it. But, after coming home from work with stiff shoulders and wrists, I decided something should be done. While I was at it, I upgraded the HF and VHF/SDR operating positions at K8GU with pull-out trays, as well. These were $10 each at IKEA and pretty easy to install, although I told Sarah that I was grateful that she didn’t witness my contortions to hold them up with my knees while driving the first screws. 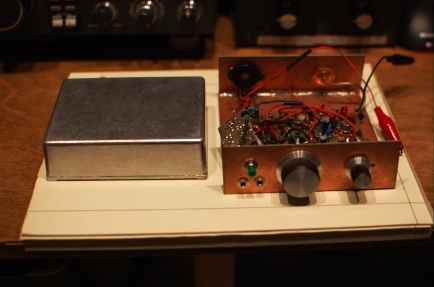 Back in high school, I built a Small Wonder Labs SW-40 that I had seen in a QST article. It lived in a variety of enclosures, but spent the last decade in the ugly PC board half-enclosure that looked like a redneck pickup truck at right. I decided to put it into a proper enclosure, being the diecast box at left. Despite the fact that I made the radio impossible (no room for front panel controls) to assemble the first time I drilled the board mounting holes, I’m pleased with the result. Four dabs of gray epoxy cover the errant holes. I probably could sand and polish those now. The power connector is a pair of Anderson Power Poles. 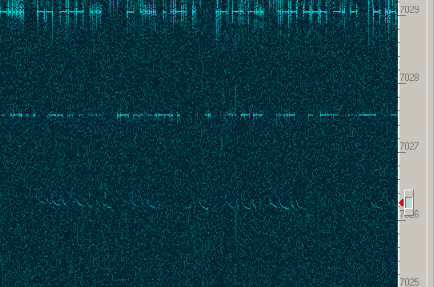 Readers of the blog have seen the screen capture from my new Softrock Ensemble II VHF. Tony does not advertise these on his site because they are not 100% supported with documentation yet. Robby, WB5RVZ has done a great service to the community by preparing step-by-step instructions for most of the SoftRock series. I’m not a step-by-step kind of guy, so I just used his photos showing the locations of the 0.1 uF and 0.01 uF chip capacitors and built the rest my way: mount all chip caps, all SMT ICs, all through-hole ICs and sockets, all through-hole resistors and diodes, all through-hole capacitors, all inductors, and all connectors. It worked right away.